There’s a new dumpling place in town. 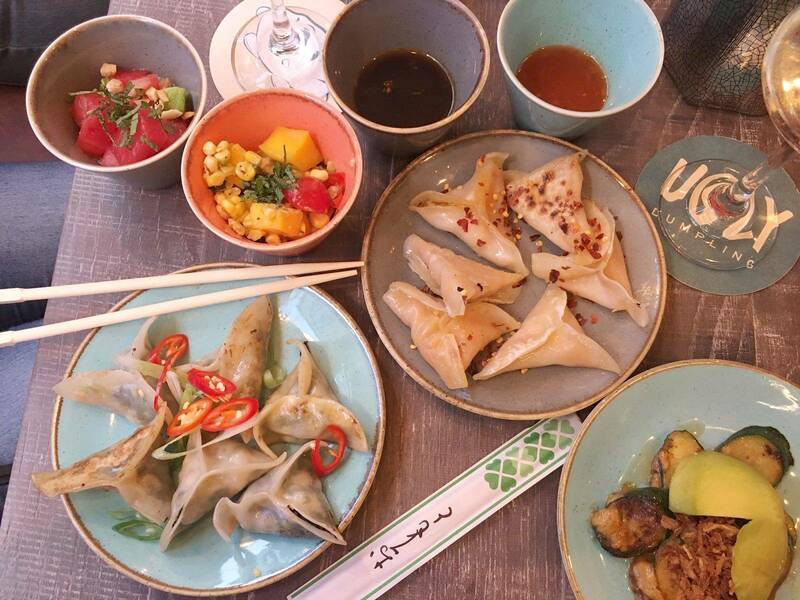 After a stint of successful pop-ups around London, Ugly Dumpling has recently opened a brand new permanent location on Newburgh Street just off London’s iconic Carnaby Street. Other than the fact it had opened very recently and had a few vegan options I knew very little about this place, so I was super excited when the manager said I could come down and try out their plant based dishes. After chatting with some of the staff, I found out that Ugly Dumpling was created by Ping Wong. It turns out she’s already an established chef having worked at Michelin star restaurant: Le Manoir aux Quat’Saisons. 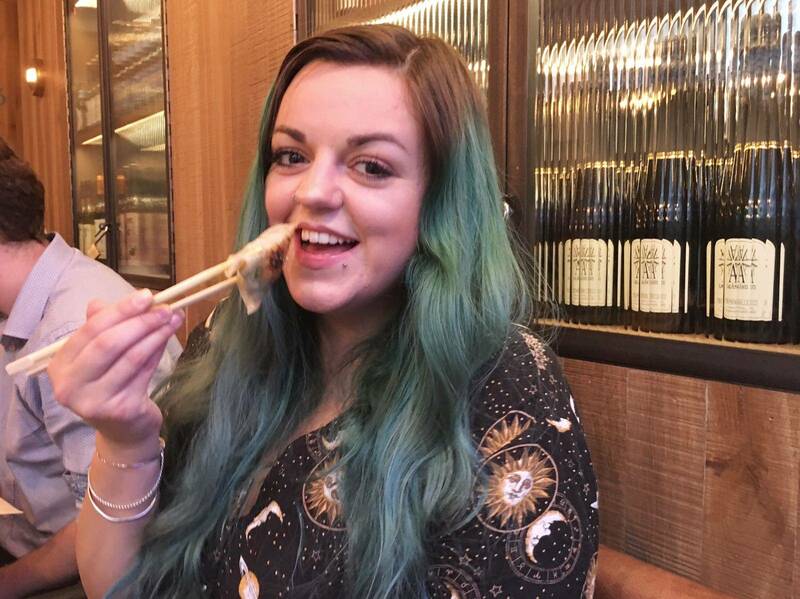 Ping grew up in a Chinese Malaysian home and discovered British ingredients and dishes later on in life, resulting in a pretty cool global fusion of flavours in her cooking. 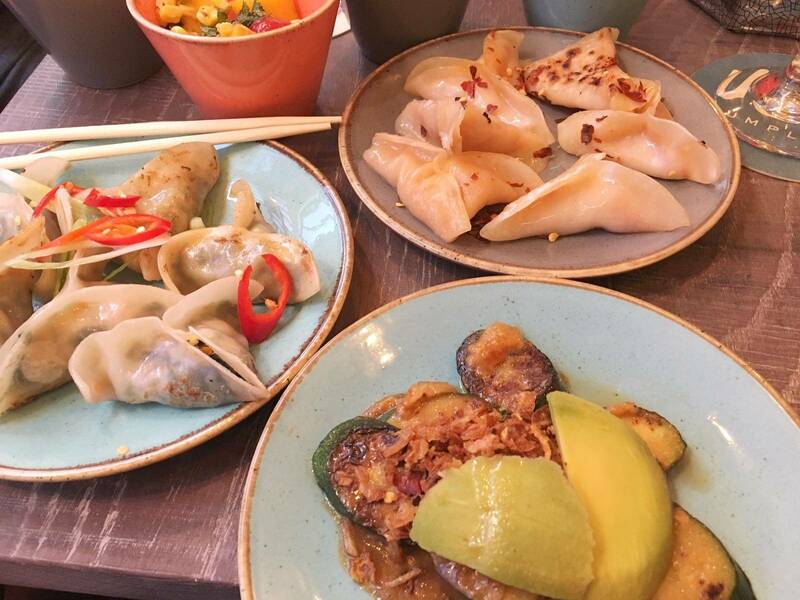 For our mains, we opted for a range of dishes, both of the vegan dumpling options and 3 side dishes. The dumplings were Spinach & Tofu, and Cauliflower & Potato. The first of the two was more a mild flavour, although very delicious. The second, more unusual (and perhaps a little bit Indian) but the flavours were so complimentary of one another. The sides we chose were all surprisingly amazing, I say surprisingly because none of the things we ordered are things I would have necessarily looked at on the menu, and expected to enjoy so much. The first: Miso-Glazed Courgette & Avocado with Sesame – I’m a little bit funny with textures and courgette is one that I’m not a huge fan of, but oh my goodness, miso-glazed and served with avocado was absolutely delicious. The Pickled Watermelon, Avocado, Peanuts, and Mint dish incredibly refreshing. It acted as a lovely palette cleanser in between bites – although again unexpected as I’m not usually someone who enjoys mixing sweet and savoury flavours. 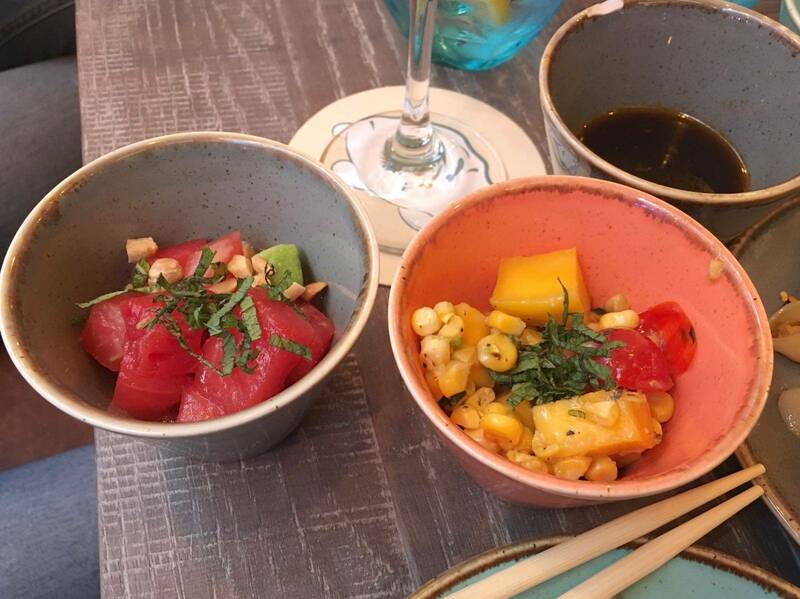 The last side we had was Burnt Corn & Mango Salsa, a Mexican inspired dish, which complimented the other flavours during the main meal, so well. We also had some sauces on the side. Usually I’m a fiend for the Sriracha sauce (which they do provide at Ugly Dumpling if wanted), but we decided to go for some sweet chilli sauce and hot chilli sauce instead. The hot chilli sauce is a top secret recipe created by the restaurants co-founder Ping, and arrives pre-made at the restaurant so the top secret ingredients aren’t compromised. Although on the menu it doesn’t look like there are any Vegan options, the lovely waitress told us that if we didn’t eat the Crème fraîche that the blueberry dumplings were served with, I was safe and everything else was plant based. You have the option to have the dumplings steamed or fried, so we went for three of each. Steamed/Fried Blueberry Dumplings (labelled on the menu as coming with Crème fraîche) – jeez, I didn’t know sweet dumplings existed but these were absolutely delicious. Warm rich blueberry inside the mild little Asian parcels. There was oil drizzled over them which I think perhaps was not needed, and I think instead (to make these even more appealing to a dairy-free crowd), the option to have a drizzle of dark chocolate and/or whipped coconut cream instead of Crème fraîche would make them even more mouth-watering. After posting a picture of the Blueberry dumplings on my Instagram story I received a whole bunch of messages, a lot in disbelief comment on how great they sounded and asking how they were. I definitely think these are worth trying for yourself! I am always so impressed with menus that clearly label vegan options with a separate symbol/letter code to the vegetarian options. The label here was on vegan dishes was vv, so it was super easy to see what dishes I could try (without me having to ask the waitress too many annoying questions). 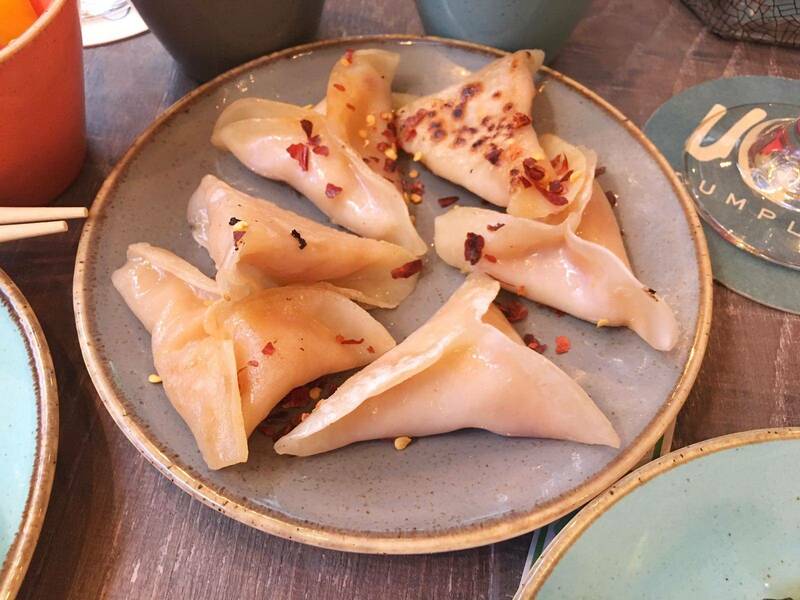 The menu prices are really reasonable, with a serving of 3 dumplings ranging from £3 to £5 dependant on filling (the vegan options are the cheapest), or you can try all five of the options in the ‘Street Food Classics’ or ‘New Favourites’ list for £6. Just to note: only one of the five options from each list is vegan – make sure you double check the menu before you order. Sides range from £3 to £5 as well, so whether you’re peckish or famished there will be the perfect sized portion for you. 1. it’s quite small (spread out over two floors), and I would guess seating capacity is around 20ish people, and they don’t take reservations. So either: you have to be there at the perfect time to nab a table, get dumplings to take away, or get them delivered straight to you on the UberEats app! 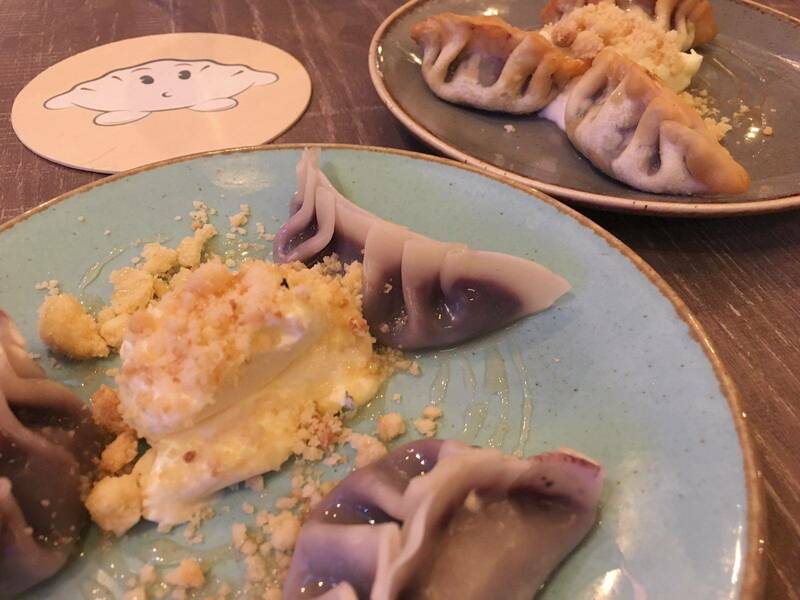 2. the restaurant’s logo is an adorable little dumpling with a face, who is not even a little bit ugly if you ask me (as the name would suggest)! The manager was very generous and gave me a sheet of stickers with the cute little guy on! 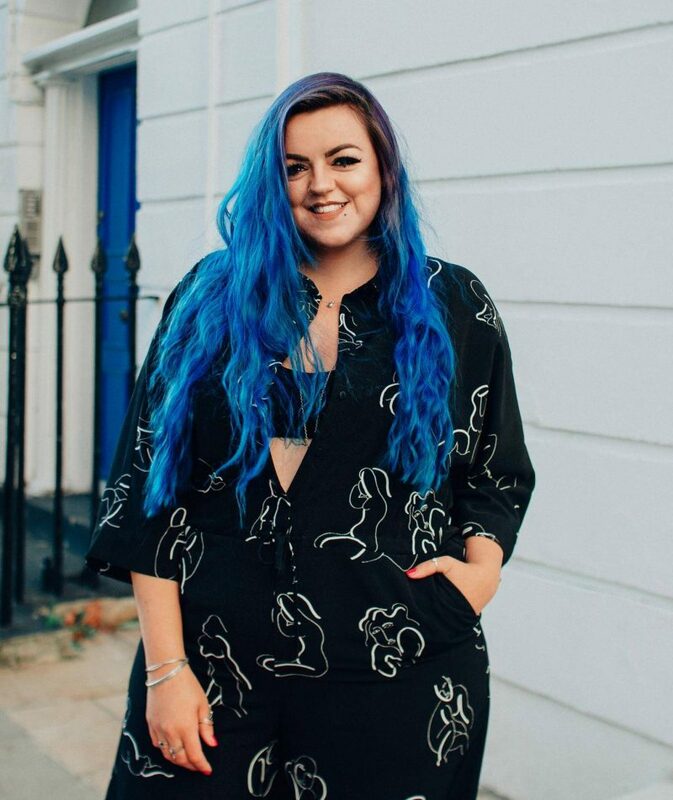 Overall I had such a lovely evening. 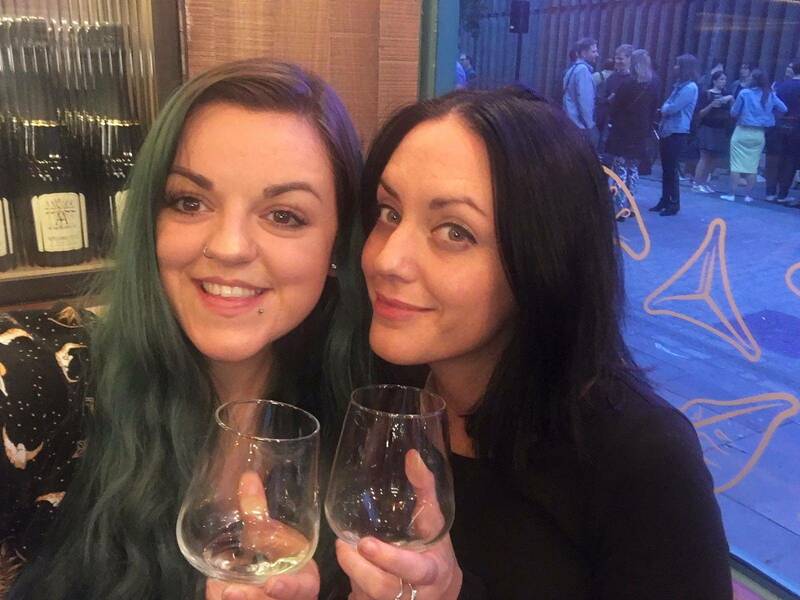 The staff were chatty and accommodating and the atmosphere was buzzing. It’s only in the past year I’ve become such a huge dumpling fan. My housemate introduced me to them (after I thought you could only get ones filled with things that are very much not vegan) and I’ve been hooked ever since. 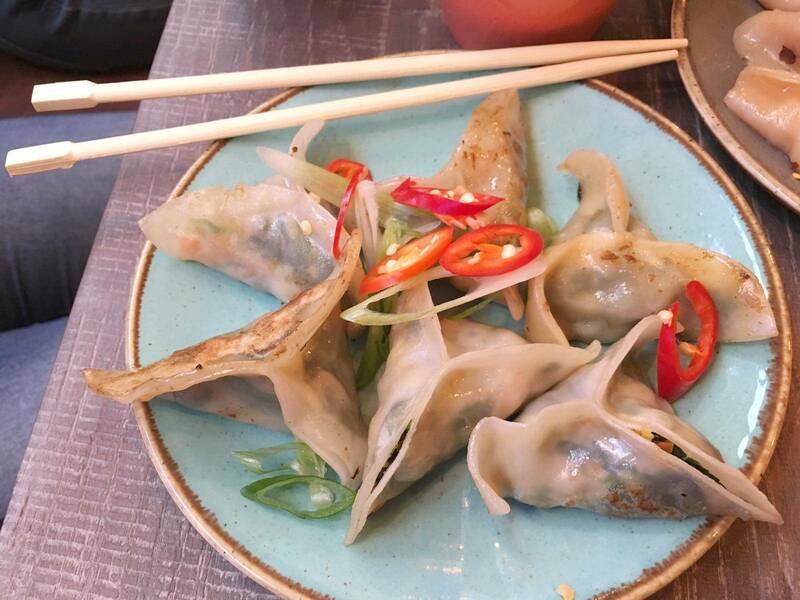 So happy that there is a new dedicated dumpling joint in London. 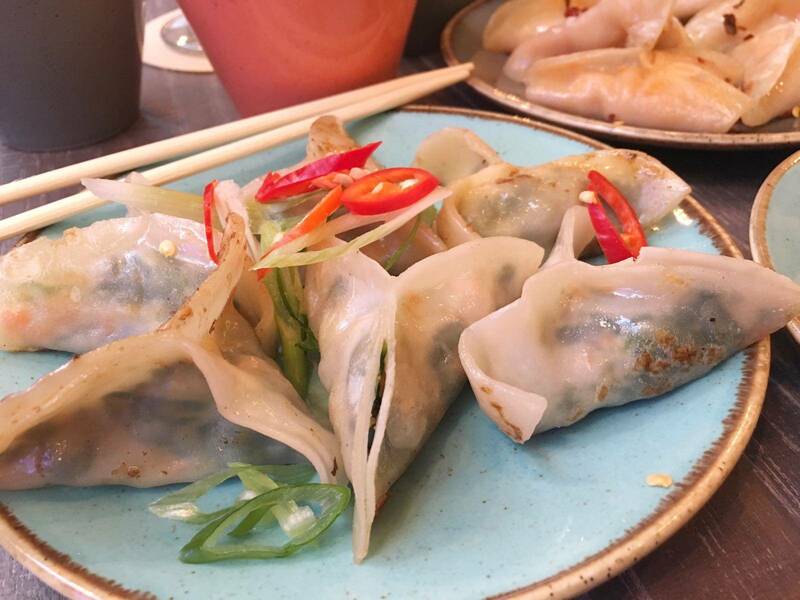 Working alongside Andrew Mead (former Senior Sous Chef at the Ham Yard Hotel), it seems that Ping Wong’s mission to transform the humble dumpling, once an Asian street snack into a new dining sensation has certainly worked. And it’s especially great they’ve done this whilst remaining accessible to the London in a quaint little blue shop, with reasonable prices on a Carnaby Street corner. 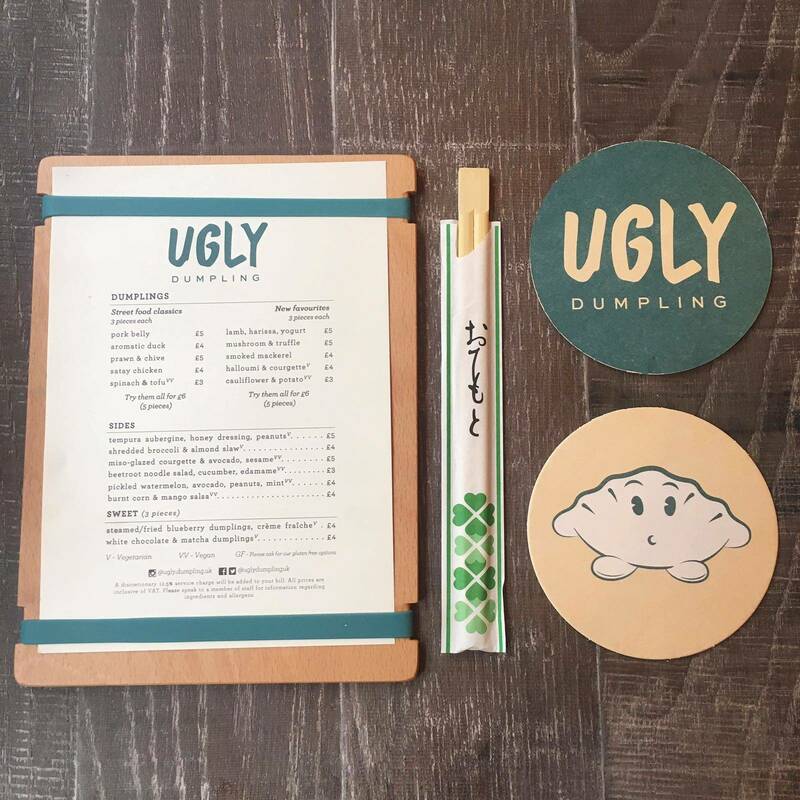 For more information (including a list of upcoming pop-up locations) check out Ugly Dumpling’s website here. This meal was provided free of charge by Ugly Dumpling in exchange for a blog post. However my review is an honest reflection of my experience. Dumplings not your thing? A stones throw away further into Soho you’ll find FIREZZA, who do delicious freshly made vegan pizzas!